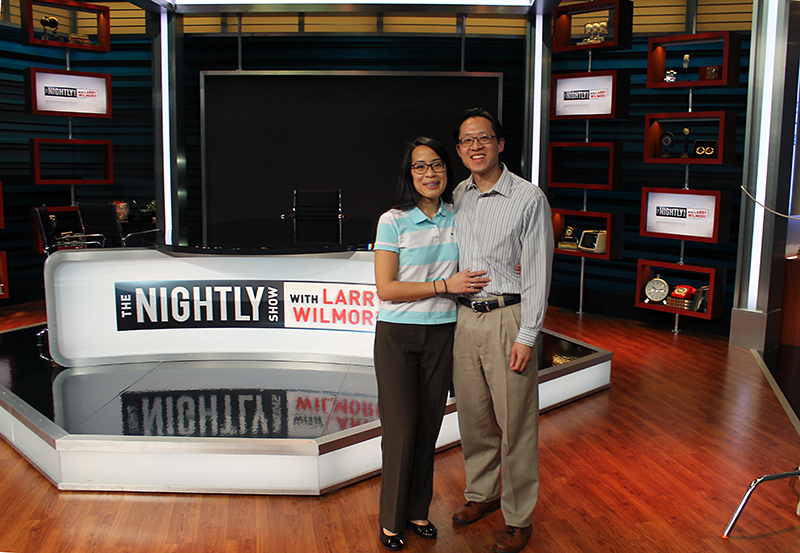 Recently, we went to The Nightly Show with Larry Wilmore! 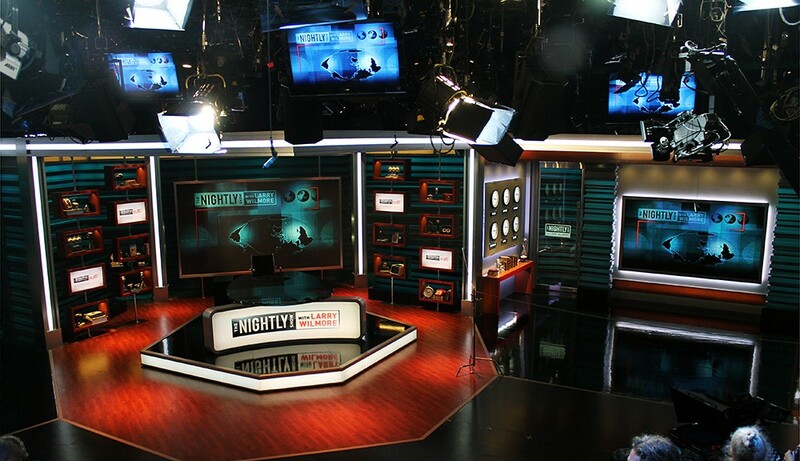 This program is Comedy Central’s spin-off of The Daily Show with Jon Stewart. 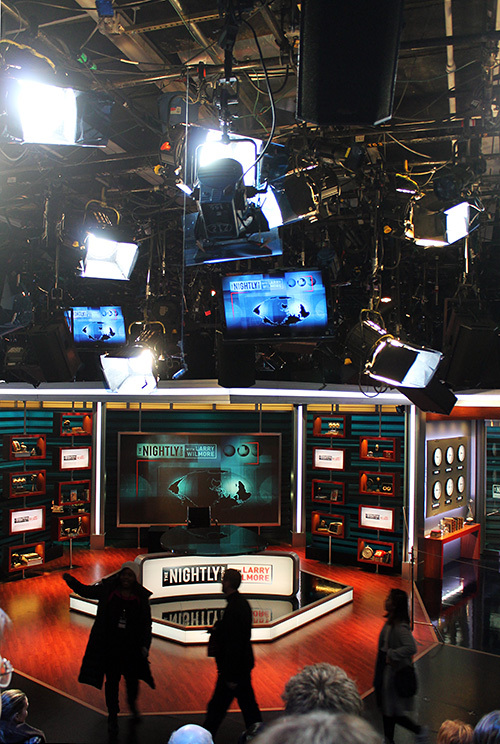 It replaced the spot of The Colbert Report and is actually filmed in the same studio as Stephen Colbert’s old show on 54th St between 10th and 11th Ave. Larry Wilmore was the “Senior Black Correspondent” on Jon Stewart’s show and was hand-picked by the media mogul to host a comedic and satirical political show in the vein of The Daily Show but from the perspective of underrepresented voices. In fact, Larry Wilmore’s show was originally going to be called The Minority Report before a legal issue concerning the similar title of a potential Fox series led to its renaming. You may or may not know that Larry Wilmore is also an Emmy Award and Peabody Award winner who has been involved with hits such as In Living Color, The Office, The Fresh Prince of Bel-Air, and The Bernie Mac Show. 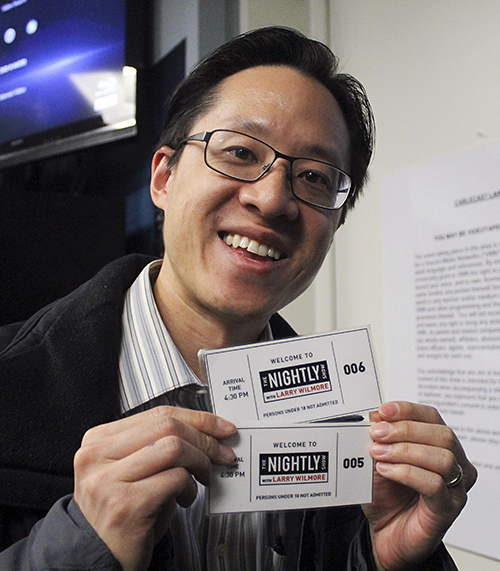 We reserved our tickets through the website of The Nightly Show and arrived on said date and time. We were able to wait out of the cold and rain under a covered awning with heat lamps before being brought into a holding room outside the studio. Then, we were brought into the studio. Before taping began, a stand-up comedian came out to warm up the crowd and to give recommendations on how we as a live audience can contribute to the show’s energy (Be excited, be enthusiastic! Laugh harder, cheer louder!). Then, Mike Yard and Rory Albanese, two popular contributors of the show, came out for a Q&A session. Rory Albanese was an executive producer of The Daily Show with Jon Stewart; now he’s executive producer and showrunner for Larry Wilmore. We were thrilled to have a Q&A session with Larry Wilmore, as well, and to see his personality off-camera. When filming began, the Stage Director cued us when to applaud to open and close each segment; all of our other reactions were spontaneous. She also cued Larry Wilmore and other contributors for video segments, comedy bits, etc. The episode we saw featured recurring segments “Blacklash 2016: Unblackening” and “Keep It 100.” The special guest was Wendell Pierce, an actor from The Wire, Treme, and The Odd Couple, soon to portray Supreme Court Justice Clarence Thomas in the HBO drama Confirmation. Larry Wilmore had a roundtable discussion with Wendell Pierce and comic contributors Mike Yard and Franchesca Ramsey. There was also a skit featuring Jordan Carlos, previously a recurring character on The Colbert Report, and 2 Chainz, a popular rapper from Georgia. Unfortunately (and not surprisingly), no photography was allowed during filming. However, after the show’s conclusion, we fans were allowed down to see the set up close and personal!